"Toxicomania and its growth are in direct proportion to illicit manufacture and trade of narcotic drugs. The measures adopted by the Convention for Limiting the Manufacture and Regulating the Distribution of Narcotic Drugs, in operation since July 9, 1933, due to the universal nature of their effort and application, unquestionably have had immediate effect in reducing the growth of toxicomania throughout the world. In celebrating today under the auspices of the World Narcotic Defense Association the Second Anniversary of the Convention, I wish to express to this noble Association the compliments of Doctor Francisco Castillo Najera, Mexican Ambassador to the United States, who deeply regrets his inability to attend this celebration. In his absence and representation, I shall endeavor to point out in a few words the means by which we are combating toxicomania in Mexico. I shall also make a few remarks on the use of Marihuana in cigarettes, according to recent studies made by Doctor Ramirez Moreno and Doctor Peon del Valle, both of Mexico. As stated by Hernandez del Castillo, a well known historian, Marihuana has been known in Mexico ever since the Conquest in 1521, one of Cortes' men being the first one to grow it and utilize its fibers in making sandals. Later on Marihuana growing became more extensive due to its use in various industries, and in the XVI Century it began being used as a narcotic drug. It was then that the Indians were persecuted by the Inquisition, which established penalties for those who became addicts. Some years later it spread as a drug and was smuggled into prisons and army barracks. The [...unreadble...] Marihuana consumption by the soldiers, who nevertheless still represent seven per cent of our drug addicts. First, the extinction of illicit drug traffic, which constitutes the social, legal and penal side. Second, toxicomania itself which in Mexico is not fought as a problem for legal medicine, but as one for what we call "Social Medicine”. Mexico considers toxicomania as a problem for which social prevention and mental hygiene are the remedies. Its treatment is entrusted to physicians who are specialists in toxicomania and toxiphrenia, working for Federal Government Hospitals. In this manner police authorities and the penitentiaries have been relieved of the burdensome task of trying to eradicate this vice by the obsolete coercive means of confinement. Marihuana up to recent years was the drug more generally used by addicts in Mexico, but of late there have appeared addicts to other narcotic drugs. Thirty-three centigrammes of Marihuana, when smoked in cigarettes, suffice to create a series of psychic disturbances in a healthy individual not accustomed to the use of the drug. It is difficult to locate a person who is an addict to smoking Marihuana. Out of 315 drug addicts on record in Mexico City, only 9% were found to smoke Marihuana. The reason for Marihuana addicts confined to our Hospitals being rather few is due to their state of intoxication not being easily detectable at the clinics, as well as to the fact that such state varies or is concealed by some addicts. It is estimated that anywhere between seventy and eighty per cent of our drug addicts not confined, are those who smoke Marihuana. They usually are beggars, vagrants and delinquents, coming out of the lower classes such as the common soldiers and the chauffeurs. The vice is more prevalent among people twenty-five to thirty-five years old, 68% of which are single and 32% married. As in other drugs, Marihuana addiction prevails among individuals of a definite psychopathic constitution of morbid curiosity, self-boasting, suggestibility, perverse psychosis, and so forth. The effect of Marihuana on the human system is the prototype of poisons on the mind, and it reveals itself as a disturber of the psychic equilibrium even in small doses. Quite aware of these facts, Mexico continues its campaign tenaciously to wipe out the use of Marihuana among all social classes, and it enthusiastically joins in all sincerity world movements for the . . . . . [ unreadable due to poor copy] . . . . . In conveying this desire of cooperation by my country, I take pleasure in extending to the World Narcotic Defense Association. Mexico's endorsement to the campaign against illicit and clandestine production and distribution of all narcotic drugs. My sincere wishes for the success of this honorable Association. May it attain within the United States of America the success desired by fifty-four Nations as to their respective territories, so that illicit narcotic drug consumption may disappear for the benefit of Humanity and its Civilization." Address of Colonel Harold Fowler, First Deputy Police Commissioner of New York City, representing Police Commissioner Lewis J. Valentine. "Narcotic drug addiction is a municipal, state, nation and international problem. It has four avenues of attack. The first is to reduce the number of addicts by isolating them and curing them, thus reducing the demand for drugs. This must be primarily a local and state activity. The second attack must be directed toward the elimination, and arrest of the street trafficker and distributor, thus striking at the supply. This is both a local and national problem. The third avenue is to coordinate, to make co-efficient and mobile all the law enforcing agencies by information, records and movements of the Narcotic criminal. The fourth is the question of international agreement as to limiting the growth of narcotics to the amount required legitimately for medical needs. The Police Department of the City of New York is attacking the problem from the first three angles, striking at the demand, that is the user; hitting at the supply, that is the seller, and then by coordinating the forces of law and enforcement through records available in the rapidly growing repository of our national and international narcotic criminal clearing house. Under the leadership of Police Commissioner Lewis J. Valentine the matter of checking and reducing the illicit drug traffic in this city has been and is being handled efficiently and effectively by the Narcotic Bureau of the Police Department of the City of New York. This bureau is under the direct command of Captain Joseph Mooney. The detectives in this Bureau are especially trained in this work. They know the drug addict and his characteristics and the procedure and methods of the lawless peddlers. They also know the laws and what evidence is required to convict an offender. . . . . . The City of New York has set aside two institutions for the care and treatment of drug addicts: The Metropolitan and Correction Hospitals. The drug addict may apply to our Narcotic Bureau, at Police Headquarters, 240 Centre Street, and be assured of receiving assistance in obtaining a reduction cure. We do not turn away any applicant for treatment. We welcome their coming. During the year 1934, the Narcotic Bureau made 1423 arrests of narcotic users and sellers and seized large quantities of drugs. In 98% of these arrests made by members of this Bureau, convictions' were obtained. In October, 1934, information was received from an official of Governors Island that narcotics (marihuana) were being sold to soldiers and C.C.C. workers. Detectives Thomas F. Mason and Arthur J. McCloskey were assigned to the case and upon arriving at Governors Island, Detective Mason was assigned to assist the chef in the kitchen, and Detective McCloskey as a laborer, both as C.C.C. workers. Detective Mason got into the confidence of a soldier in the kitchen who purchased for him a quantity of marihuana, and also told him where he could obtain any amount. This soldier was later tried and sentenced to serve I year in the U.S. Disciplinary Barracks at Governors Island. On October 17th, the detectives went to No. 17 Concord Street, Brooklyn, N. Y. where they met Louis Kelly and Robert Arnold, to whom they introduced themselves as men from Governors Island. These two men sold Detective Mason a can of marihuana for $2.00 and also mentioned that they were growing the weed in the rear yard of 187-189 Washington Street, Brooklyn. They were both arrested and a large quantity of marihuana was found in premises 17 Concord Street. Also, at 187-189 Washington Street, a plot of ground approximately 125' x 150' was found, on which a crop of marihuana was growing. Arnold pleaded guilty and was sentenced to serve 2y, to 10 years in States Prison by judge Taylor in Kings County Court. Kelly was allowed to plead guilty to a misdemeanor and was sentenced to the N. Y. C. Penitentiary by the same judge. . . . . . .
“These are a few things that have come up in my work that are not generally known, even to those who contract drug addicts, especially in relation to Marihuana which can be grown in practically every State in this country. Patches of this hemp plant have been found growing successfully in many parts of New York State, both under cultivation and in the wild state. The illicit traffic in this drug, chiefly in the form of cigarettes under the name of "moguls" and other names is spreading and we are getting more arrests and convictions for peddling Marihuana. '”State Laws are necessary to meet this menace. New York State has a good law. California has a good law. Several of the Western States have good laws. In many States, however, the laws are ineffective; in some cases the Statute Books being without any laws." Mr. COPELAND. Mr. President, I ask that a series of addresses made in connection with the narcotic evil be inserted in the RECORD. As health commissioner of New York I became familiar with the evils of the traffic in narcotic drugs, and I am heartily in sympathy with the efforts being made to deal adequately with the problem. I am informed that the last in the series of broadcasts on this subject will be an address by the Attorney General of the United States. 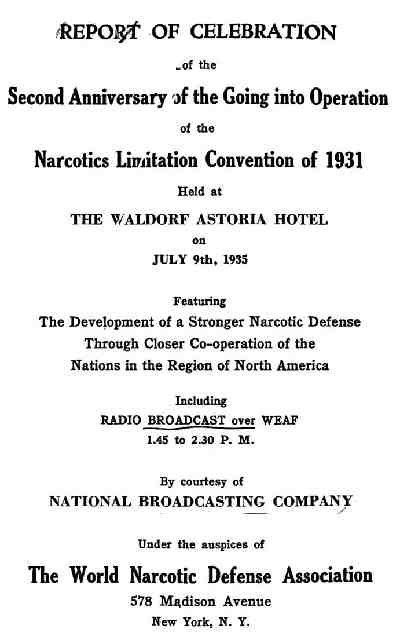 The announcer said: "This is the fourth in a series of broadcasts under the auspices of the World Narcotic Defense Association, of which Admiral Richmond P. Hobson is president. The narcotic association is now carrying on a comprehensive campaign to secure adoption by all our States of a uniform law on narcotics.
" Today eminent narcotic authorities will discuss the general question of law versus the narcotic drug evil.' Mr. Hayne Davis, vice president of the narcotic association, will conduct the broadcast and present the speakers." Mr. Davis said: “The urgent need Is to secure interstate accord on narcotics through adoption of the uniform narcotic drug act by all the States of our Union. You are privileged today to hear from the very highest authorities on this subject: The United States Commissioner of Narcotics, Mr. H. J. Anslinger; the president of the American Bar Association, Hon. Scott M. Loftin, of Florida: the president of the Bar Association in 1932, when that association endorsed the proposed uniform narcotic drug act, Hon. Clarence E. Mart" of West Virginia. Opium has been a boon to mankind in alleviating suffering, but a terrible curse to those who have become victims to its abuse. The hope of a practical solution lies in strict control of the production, sale, and distribution of narcotic drugs, as well as of the raw materials capable of use in the making of these drugs. Great progress has been made in these directions, and further progress is in prospect. The first opium conference was the outcome of American Initiative. Similar conferences, with wider scope, followed in due course, at The Hague in 1912, at Geneva in 1925 and 1931. The delegates assembled at these conferences from all parts of the world were appalled by the evidence of human wreckage and misery, through the abuse of narcotics which was laid before them. They were alarmed also by proof that this evil was rapidly spreading throughout the world. Some of those who were thus enlightened as to the fact and extent of narcotic drug abuse, resolved to stamp out this evil, and at each conference they succeeded In securing general consent to some plans calculated to further this good purpose. At the 1931 conference great strides were taken by agreement upon terms for effective limitation of the manufacture of narcotic drugs to the actual needs of mankind, for scientific and medicinal purposes, and for strict control of the drugs manufactured for these purposes so that none of them would find their way into the channels of illicit trade. The treaty evolved by that conference constitutes the most powerful blow that has thus far been dealt to the illicit narcotic traffic. This treaty is now the basis of international accord on narcotics. Indeed, the Limitation Treaty of 1931 may properly be called the Magna Carta of world freedom from the narcotic drug tyrant. Internationally, the allied forces in the warfare on the narcotic drug evil have achieved great victories, and are now consolidated in a strong position, well prepared for the next offensive. In the United States, however, there is weakness in the lines of defense against this enemy of all mankind. "This la due not to willingness among our good people to let this evil have its way here but to the division of sovereign power between the Nation and the States composing the Union, and to the difficulties encountered in getting full information on the narcotic problem Into the hands of the several thousand State legislators, who alone have power to enact the laws necessary for consolidating this country behind the National Government in the splendid position it has taken on narcotics. Long ago the Treasury Department took steps so far as it lawfully could to limit manufacture of narcotic drugs in the United States to the needs of this country for scientific and medicinal purposes. Its broad policy is to limit the importation of opium and coca leaves to the medical and scientific needs as determined by the United States Public Health Service, and to control manufacture and the distribution of the drugs made from the raw material so imported. This distribution is under effective control from Importation of the raw material to delivery of the manufactured drug to the consumer. I know of no finer tribute to the control system of your National Government than one expressed by a delegate of Canada at a recent world narcotic conference. He said that the United states manufactures drugs for 120,000,000 people, and that there is a 3,000-mile border between the two countries, making smuggling comparatively simple, yet in all his experience he had never found narcotics of American manufacture in the illicit traffic in Canada, although he found large quantities of narcotics of European manufacture. “Our entire field force does not exceed 300 officers for the whole United States, or 1 for each 400,000 of the population, and It can be readily, seen that the ordinary police work of narcotic law enforcement, such as the detection and apprehension of the many petty street peddlers and the even greater number of those Improperly possessing narcotics, cannot be adequately performed by Federal officers. State cooperation is essential to a reasonably adequate system of narcotic law enforcement, and the several States of the Union have a serious obligation to perform in doing their proper part in the suppression of this evil. "The adoption of a uniform narcotic drug act by all the States will do away with the existing weaknesses in our narcotic laws by giving to the people of the United States and of each State as good protection against the narcotic evil as can be secured through legislative action, will enable the authorities of the States to cooperate more effectively with each other and with the officials of the National Government, and will be a great aid to the United States in properly fulfilling its part in combating the narcotic evil in those phases which can be dealt with effectively only through international cooperation. We obligated ourselves to control production of opium under The Hague Convention of 1912. We can fulfill that obligation under this State legislation." “No one knows better than Mr. Anslinger what the present law an narcotics is and what that law ought to be. "Members of the bar who have been recognized by their colleagues as worthy of election to the presidency of the American Bar Association are certainly qualified to plead the cause of law versus the narcotic drug evil before the supreme court of public opinion. You will now hear the views of Hon. Scott M. Loftin, of Florida, president of the American Bar Association, regarding the uniform narcotic drug act. Mr. Loftin found it impossible to be here today, so I shall read a message received from him. It has long been customary for the Governors of the several States to appoint commissioners on uniform State laws to confer with one another on those questions, in which uniformity in the laws of the States is deemed to be for the best interests of the people. The Forty-second Annual Conference of these Commissioners on Uniform State Laws, held in 1932, formulated a comprehensive program of legislation on the narcotic problem, which is commonly known as the " uniform narcotic drug act." The American Bar Association held Its meeting for that year soon after this act was approved by the conference of commissioners. The act came very appropriately, therefore, before the Bar Association for consideration at its 1932 session. "The Honorable Clarence E. Martin was president of the Bar Association that year, and he was also a member of the Conference of Commissioners on Uniform State Laws, which formulated this act. He is especially well qualified, therefore, to explain in detail how the adoption of this act by all the States will promote the welfare of the American people. As President of the American Bar Association, I content myself, therefore, with saying that there is no member of our association better qualified than Mr. Martin to demonstrate the present need for adoption of this act by all of our State legislatures. In addition, I am saying a few words more as a citizen of the State of Florida. The proposed uniform narcotic drug act was adopted by the Florida Legislature in May 1933, and the people of Florida were benefited substantially and immediately.
" 'Few enactments of the 1933 legislature were more significant In purpose or sounder in design than the uniform State narcotic law.
"' ‘Occasion for reflection In this regard was presented by the important marijuana arrest and seizure here last week.
" 'The sale on which the case was made involved 2 pounds of the dried weed prepared for smoking.
"' Subsequent investigations led to a larger seizure and the discovery that the plant from which the drug is made has been grown Inside the city limits of Jacksonville.
" 'First among the points to be noted is that the case could not have been made prior to the passage of the uniform State law. The Harrison Act applies only to opium and coca leaves and their derivatives. "'In the second place, the case affords illustration of the integration of enforcement agencies under the new law. It resulted from the cojoint efforts of Federal, State, and city forces. "'Again, it properly relegates the prosecution of such crime to local courts set up for handling of local problems. The Federal Bureau of Narcotics is left free to exercise its major function of controlling medical movements and smuggling. "'Eight of the 24 cases made here strictly under the uniform law have been tried and eight convictions have been returned. "'Scheduled for trial are two types of cases not covered previously. One doctor's license is up for revocation and several addicts will be prosecuted for obtaining narcotics under false pretenses. "'Revocation of medical licenses and restriction of drug Issue through misrepresentation by addicts were not provided for In former laws. “ ‘Through the closing up of loopholes and the coordination of existing regulatory agencies, the new uniform State law places that control upon a higher basis of Intelligence and efficiency. "I conclude by saying that, in my opinion, all of the States should adopt the uniform narcotic drug act, so as to effectively cooperate with the Federal Government in its war against the illegal drug traffic, and, I will add, so as to secure for the people of each State the protection which we In Florida now enjoy through the adoption of this act in 1933. Mr. Davis then said: "Here you have proof from experience, brief but convincing. And after hearing these words of Mr. Loftin, president of the American Bar Association, in regard to the qualifications of Hon. Clarence E. Martin, of West Virginia, that gentleman needs no further introduction. Mr. Martin."